When you use a plastic spoon in boiling water or drink out of a plastic water bottle on a hot day, you might wonder if the plastic is at risk of melting. Like every other substance, plastic has a melting point, which is the temperature at which it changes from a solid to a liquid. Different types of plastic have different melting points because they are different chemical compounds. Different types of plastic have different melting points. For example, PVC melts at between 160 and 210 degrees Celsius (320 and 410 degrees Fahrenheit). This means water has to be within this temperature range to melt PVC. The temperature at which the solid and liquid forms of a pure substance can exist in equilibrium is known as its melting point. For example, when a piece of plastic is heated, its temperature rises until melting point is reached. At this point, additional heat converts the plastic into a liquid without changing the temperature. Once the entire piece of plastic is melted (i.e., is entirely liquid), any further rise in temperature will raise the temperature of the liquid. If the melting point of plastic is greater than 100 degrees Celsius (212 degrees Fahrenheit) the water is in the form of steam, because evaporation takes place. Gas molecules leave the liquid to go into the gas phase. The chemical makeup of a plastic determines its melting point. For example, PVC melts at between 160 and 210 degrees Celsius (320 and 410 degrees Fahrenheit). Different types of HDPE have a melting point range between 210 and 270 degrees Celsius (410 and 518 degrees Fahrenheit). Different types of polypropylene melt between 200 and 280 degrees Celsius (392 and 536 degrees Fahrenheit). If the plastic is impure due to the presence of other compounds, its melting point is lower. Exposure to moderate heat may not melt your plastic water bottle, but it may still pose health risks. The "chasing arrows" symbol you see on plastic bottles provides the information you need to stay safe. For example, PET (polyethylene terephthalate, which is found in most water bottles) has a symbol with the number 1 inside it. Repeated use of PET bottles increases the risk of carcinogenic leaching, so they are intended for single use applications. Number 1 plastics should be recycled but not reused. 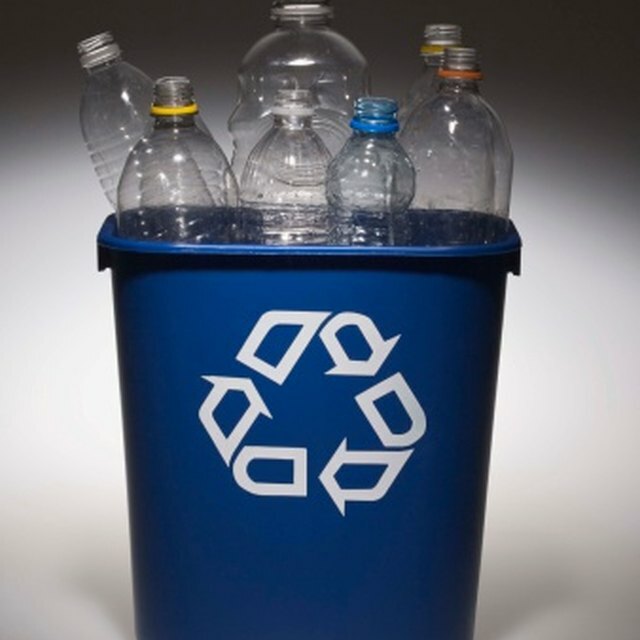 On the other hand, HDPE plastics (high-density polyethylene, which is often used for toys, plastic bags, milk jugs and detergent and oil bottles) bearing the number 2 symbol are both recyclable and reusable. Number 2 plastics do not break down under sunlight exposure or extreme temperatures. University of Illinois at Urbana-Champaign: How Does Water Turn Into a Gas? Gillespie, Claire. "How Hot Does Water Have to Be to Melt Plastic?" Sciencing, https://sciencing.com/hot-water-melt-plastic-8951.html. 02 May 2018.